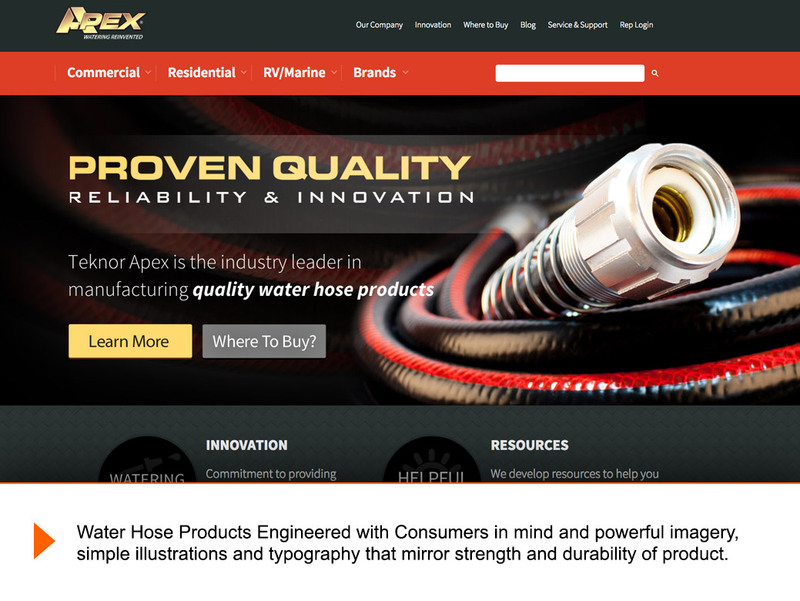 Global Water Hose Manufacturer Develops Marketing Site in Hubspot COS! Teknor Apex, a privately held firm, was founded in 1924 and is one of the world's leading custom compounders of plastics. The company began producing vinyl water hoses in the 1950's and today is the largest hose manufacturer in the United States. The company operates thirteen facilities worldwide in the United States, the Netherlands, the United Kingdom, China and Singapore. All hose manufacturing is done in the United States. 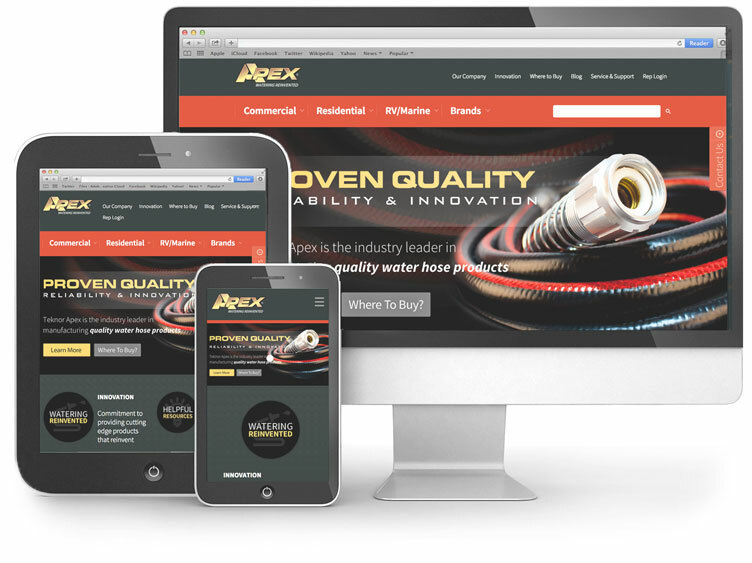 Apex Hose wanted to improve their marketing site by enhancing their messages and technologies to connect with changing residential and commercial market segments. They wanted to be found by buyers online and on multiple devices (desktop, tablet, mobile). Driving more business to those selling Apex Products was important, but more important was collecting consumer feedback and providing innovative products, resources and tips. At the core, Apex wanted to track month over month performance and continuously gather data to improve communication and products accross market segments. Xzito worked with consumer product leaders at Apex Hose to facilitate and implement key messages, technologies and strategies required to bring Apex Hose new "Watering ReInvented" global positioning and value proposition to life, and reinforce its positioning as a leader in Water Hose Engineering. 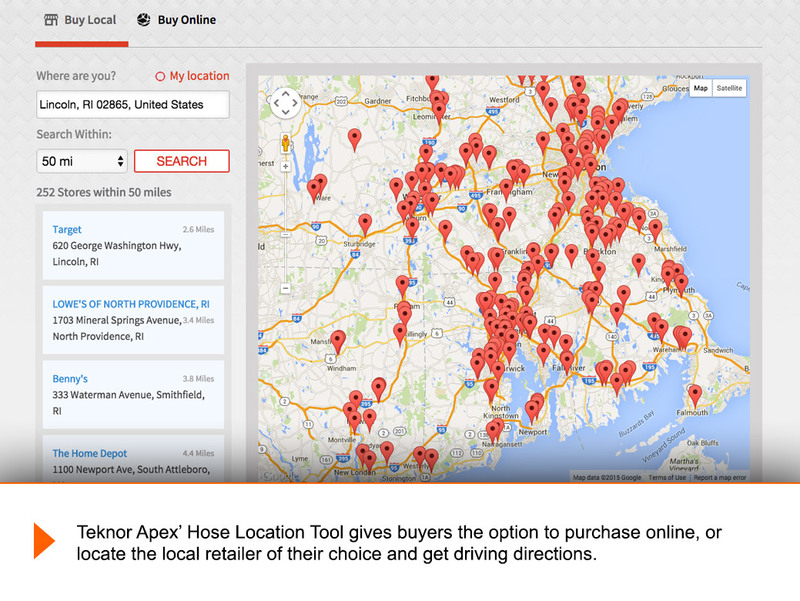 We clearly answered “Why Apex Hose? What makes Apex different?" What's in it for you?" We created a site architecture to help consumers easily find products by usage, or brand and then make a purchase either online or locally via an advance Water Hose Location Tool. 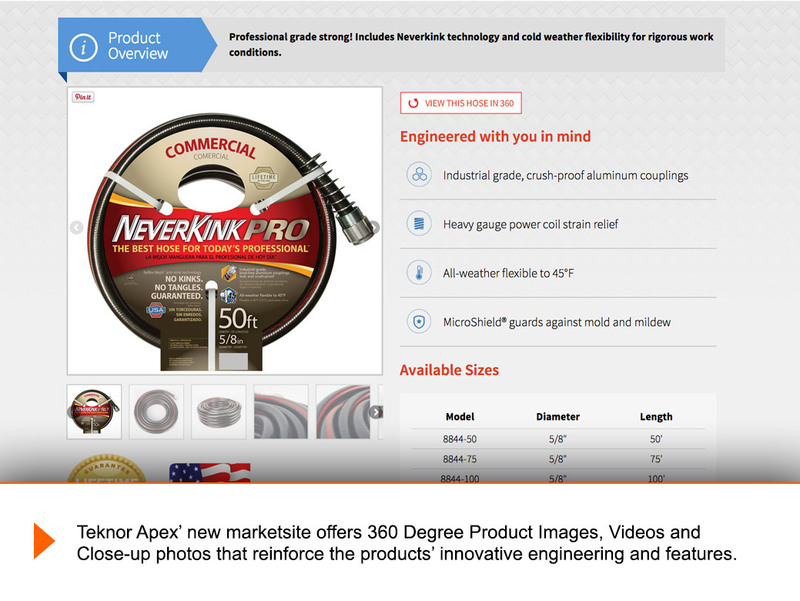 This tool is driving consumers to over 15,000 loyal Teknor retailers. We employed Contextual Marketing in order to talk the visitor’s language. The site is equipped with Hubspot COS to target smart, personalized content and offers to the specific buyer personas. We currently employ 9 persona's and over 600 pre-identified users. 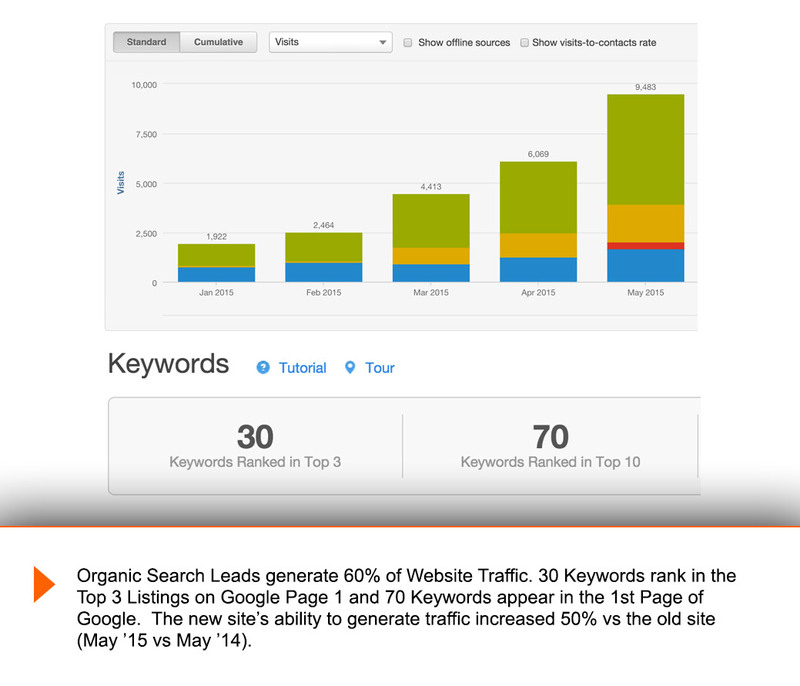 We optimized the site with best practices in Search Engine Optimization, the site currently has 30 Keywords on #3 position, and 70 keywords on the 1st page Google and 60% of the site traffic comes from Organic Optimization. 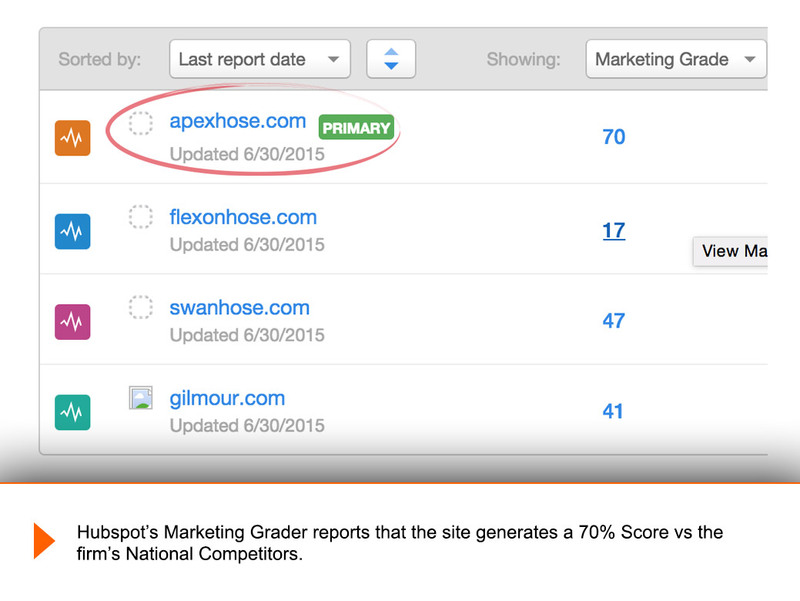 We built a custom search module integration the Google Search Platform and Video Integration with Wistia. We optimized the site for any screen size, and platform (mobile, tablet, desktop) and resolution with HD Images and minimal scrolling. We also took stunning photos and 360° product videos to appreciate product detail and develop easy to understand product features and functions. We used powerful design imagery, simple illustrations, and typography that mirrors the strength and durability of the product. Finally we developed a "Do-it-Yourself" Blog and resources whose quick tips on product application and social sharing, and commenting options empower consumers at each stage of the buying process.